There are many reasons you may choose to keep gasoline on hand. You may own a gas powered lawn mower (or other piece of yard equipment), or you may have some around just in case your vehicle runs out. Storing some gasoline can save you the inconvenience of having to make a trip to the gas station. There are, however, some safety precautions you should take if you are storing gasoline, to ensure you are doing it the right way, and not putting yourself, or anybody else, in harm’s way. Below are some tips for safely storing gasoline. Gasoline should always be stored away from your house or place of occupancy. This is all the more salient if you have children. A garden shed is typically where people will keep gasoline (if they have one). Before storing gasoline in a self storage unit, it is important to check if this is allowed at your self storage facility. 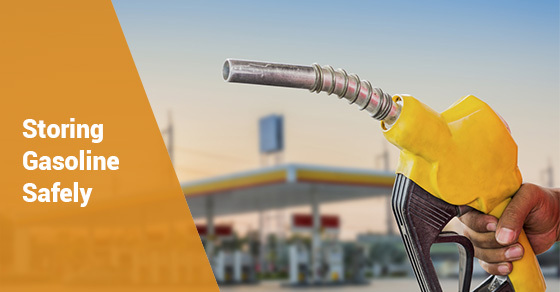 Gasoline is a hazardous material, and for your safety and the safety of others, many facilities do not allow gasoline to be stored in their units. The fumes from gasoline are noxious and can quickly make you nauseous or dizzy if you are handling it in a confined area. If you have your gasoline in a self storage unit or other confined space, and you need to open the container in which it is kept, always take it outside of the confined space before you do so. Gasoline, like any flammable liquid, should be stored at room temperature, out of range of any potential heat sources (including the sun, hot water, a space heater, a furnace, etc. ), and at least 50 feet away from any ignition sources. A climate controlled storage unit is a good additional safety measure to ensure your gasoline never runs the risk of overheating. Many people don’t realize it, but gasoline, by law, is required to be stored in approved containers or tanks. Before you think about putting gasoline into a self storage unit, make sure it is in the right container. This is to ensure that the gasoline doesn’t eat through something that isn’t up to the task of storing it. There are always safety precautions to keep in mind when storing anything that is potentially dangerous, and gasoline is no exception. If you are planning on keeping gasoline on hand, ensure you are doing so in a manner that keeps you, your family, and those around you safe and sound. Follow the above gasoline storage advice and never have a problem with your gasoline storage.